Taste test: The name of these chips threw me off a bit. Spicier Nacho? Spicier than what? The good news is that they are spicier than some things, but the bad news is that the things that they're spicier than are barely spicy at all. When you first bite into these, you don't notice the spice at all  the taste is all cheese. After several more bites and a short delay, a mild spice slowly kicks in. But it never really gets all that far beyond the mild spice stage. 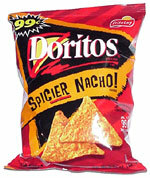 They taste quite good, kind of like Nacho Cheesier Doritos but with some kick. 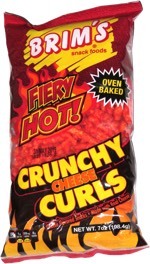 Smell test: There's a nice spicy kick to the cheese smell of these. This snack was discovered by Jeremy at Jiffy Mart, Ludlow, Vermont.